When an artist is so moved by the release of his new album to break a world record for highest-altitude concert, it’s hard to avoid puns about other high things: spirits, melodies, hopes. Norwegian artist Magnet raised just such allusions in a March solo acoustic performance of his new album in a plane between Oslo and Reykjavik (in-flight altitude: 40,000 feet; check the video). Now the album is being released stateside, and the question is: will the high spirits of the album live up to the high hopes for its release? Will its world record for altitude take the album to similar heights on the charts? Before we tackle those questions—what is it about Scandinavian indie rock artists? First Peter Bjorn and John come out of nowhere (er, Sweden) with “Young Folks,” with a whistle hook to die for (and which is already being sampled by Kanye West). 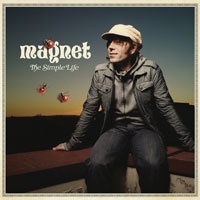 Now Magnet, aka Even Johansen, brings a brilliant collection of pop songwriting in his third full-length, The Simple Life, along with pop production that the Shins would give eyeteeth for. What is it about the Scandinavians? Something in the Northern Lights, perhaps. Instead, The Simple Life is a collection of upbeat, clever pop, propelled by killer horn and string riffs and buoyed by Johansen’s high, aching vocals. Where The Tourniquet’s “Hold On” registers as an urgent, synth-thick plea, many of the songs on The Simple Life are joyous little ditties, including the handclaps of “The Gospel Song” and the bouncy drumline of “Lonely No More.” Throughout, unusual instrument choices pop out of the texture: a banjo here, a treble harmonica there, poking through the horn sections and pianos. In fact (again apropos given Magnet’s world record), the one adjective that comes to mind over and over again on relistening to the album is buoyant. That is not to say, however, naïve. The song craftsmanship is tight throughout, with “You Got Me”’s brilliant fingerpicking and horns offset with the string quartet and oboe of “Count.” Buoyant goes a little overboard in the cover of Bob Marley’s “She’s Gone,” including whistle chorus and woodblock percussion. It’s like a meringue, so airy that it threatens to dissolve into nothing at every turn. It holds together somehow, but I sincerely hope a full Magnet/Marley tribute album isn’t in the works. Is this going to be the album that sends Magnet up the charts, to the toppermost of the poppermost? Unlikely. For all the airiness, there is a depth of sadness and empathy in the lyrics that grounds the album in an un-poplike sensibility. So it is that a wine bottle solo in “Lucid” takes on emotional resonance that belie the rest of the album’s grin. And this is the ultimate joy of The Simple Life: it bears close examination and re-examination and brings new pleasures in each new light, all while still remaining a hummable pop masterpiece. So, probably no pop stardom for Magnet. But maybe the beginning of a beautiful friendship for the lucky listeners who wind their way into this album.